Hi everyone, I am back on product review section with my take on a smoothing serum from the house of The Body Shop. Before I start off this review journey, wanted to say that I am actually in deep love with few of their products- facial oils, scrubs, and masks, but sadly this serum has come out to be a complete disappointment for me as a serum but works well as a light moisturizer. I am from those who hunt for any new releases from natural/ organic brands with an intuition that it will somewhere save my skin from loads of parabens and preservative chemicals but then we do expect some results. Don’t we and here it fails. Scroll down for review. 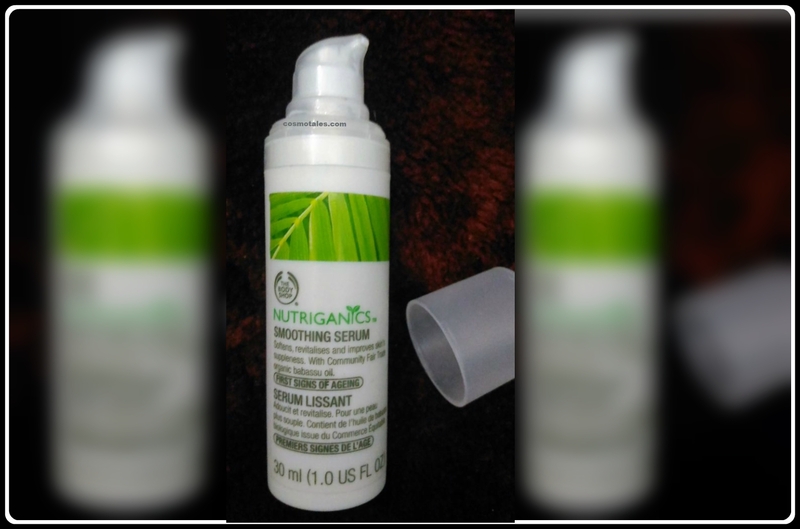 The Body Shop Nutiganics Smoothing Serum claims to fight first sign of aging. It promises to soften, revitalizes and improve skin suppleness with its community fair trade babassu oil. INR 1990 For 30ml (1.0 US FL OZ). Sadly this little bottle lacks ingredient list but it says- 99% of total ingredients are from natural origin. 34% of the total ingredients are from organic farming. Natural and organic cosmetics certified by ECOCERT. The serum comes in a cute little cylindrical bottle that was packed in a cardboard box, which I don’t possess now. The bottle is pretty small- smaller than your palm and has its name and other description labeled on its round curvature body. It has a pump dispenser for dispensing only the right quantity of product. I know most of us want a serum to be actually a serum- light, translucent, gel or watery textured. But this one is almost like a very light moisturizer that seems white on dispensing but glides on as a transparent base. It does take few minutes to get absorbed. The smell is quite subtle and natural- that does not linger. Let me be very clear I have not set very high standards for this little baby but then I expected it to something. The serums are expected to have an extra edge over moisturizers, and so do I wanted. 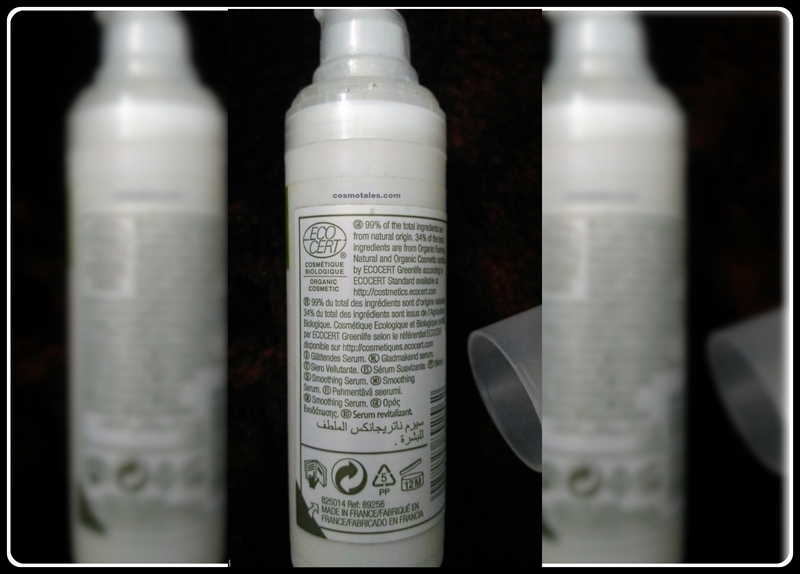 I have been using this product from 3 months now and in initial few weeks, I felt it does nothing to have stopped being regular with this. And was simply lying on my vanity- but then I thought to give it one more try, sadly spent a huge on this. 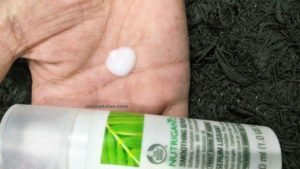 So here I am with the review after one more attempt– upon application it gets absorbs easily and imparts a suppleness with radiant finish that lasts for about an hour. The skin felt nourished for time being but then again it disappears after few hours. If you follow this with a moisturizer it becomes heavy over your skin. I didn’t see any improvement in the initial sign of aging but it works great if you use it as a light moisturizer- provides nourishment and hydration. That what it does – don’t expect it to be your savior for fighting aging. 2.5 out of 5. (I use it as my moisturizer now not as a serum). I won’t recommend- The Body Shop Nutiganics Smoothing Serum, for those aspiring for serum, as there are pretty good ones in the same range that will pamper and fight the inevitable curse of aging. But you can go ahead with this as a moisturizer.